With the holidays approaching, and family arriving (though not for us this year), you’ll want to have some quick and easy breakfast/brunch ideas to have handy. One thing that I love to do is make cinnamon rolls or set out a simple breakfast buffet table with selections such as scrambled eggs, bacon, breakfast sausage, English muffins, and bagels. Another way I like to prepare breakfast or brunch for a larger crowd is to make a breakfast casserole. Casseroles tend to be a staple in our house at this time of the year anyway, so why not apply that to breakfast? 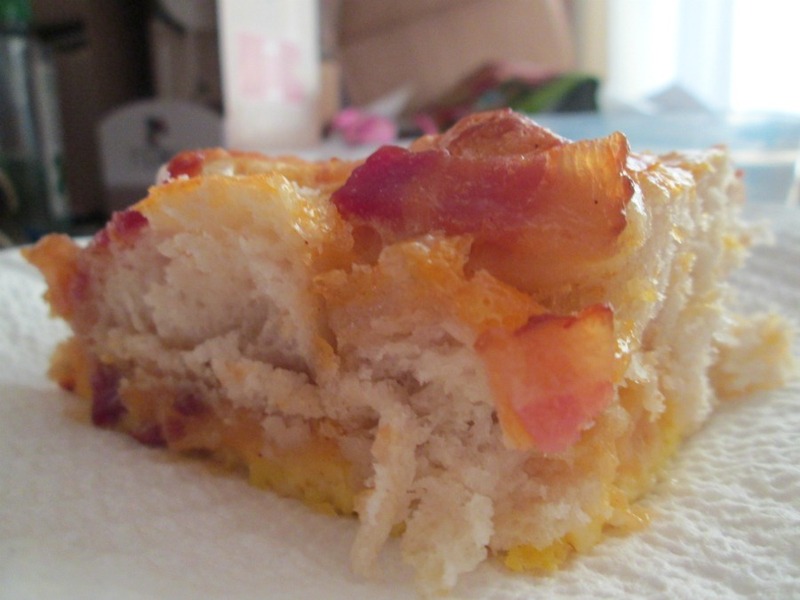 I just had to try this delicious canned biscuit breakfast bake recipe. After doing a Google search for breakfast casseroles that use bacon, I came across one that I thought we could definitely do. Next time I know what I’ll try differently, but all in all this was absolutely delicious and so easy to put together! Best served warm though this also tasted delicious the day after. The next time that we make this, we’re going to add in green pepper and onion, just to give it a little more flavor and to make it more rounded as a breakfast. Don’t get me wrong, I have no complaints with how this turned out! The combination of bacon, egg, biscuits, and cheese is definitely a favorite of mine and I love how easy this was to make. The eggs somewhat settled on the bottom and reminded of a cross between an omelet and a quiche. Using the taco cheese mix gave it a bit more flavor than using regular cheddar and I really enjoyed that as well. I could also see myself making this for coffee hour at church, though I think I might have to double the recipe if I do that. This looks like it would double easily though. Baking the bacon I think makes a difference too. Though you can fry the bacon in a pan, I like baked bacon for recipes because it’s easier to work with. Plus, I don’t have to worry about bacon grease splattering everywhere. When bacon is done baking, let cool slightly until you are able to work with it with your hands (… optionally, you can taste test and make sure that it’s not going to burn your mouth). Angle the cookie sheet slightly by placing a rolled kitchen towel or folded potholder under one side to help drain the bacon grease to one corner. What do you like to make for breakfast when you have company? Oh wow this sounds just delicious! I would love to try it someday. 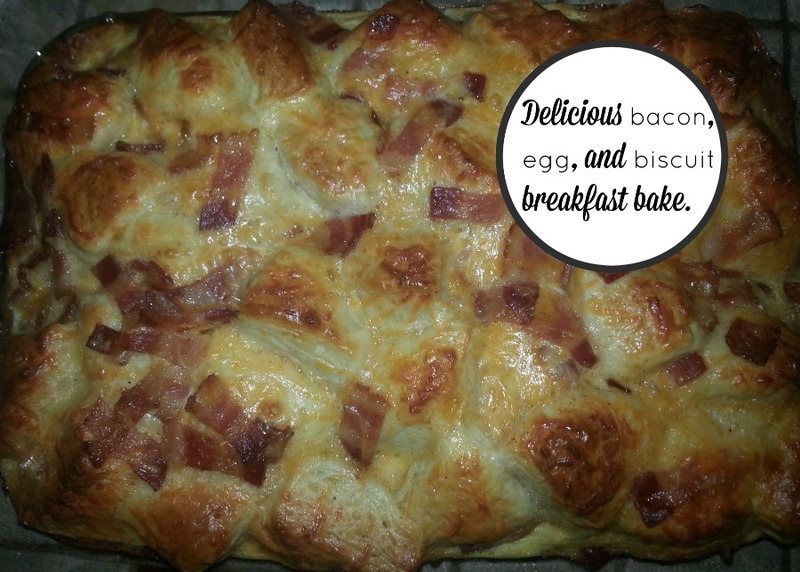 I have never tried a breakfast bake before, but it looks amazing! Sounds pretty fulfilling, too. That’s exactly what I custom order for my dinner tonight if I could. It looks positively Delicious. This looks amazing! Have to try it for one of these holiday mornings, thanks for the recipe! I love these kinds of breakfast meals! Perfect for holiday mornings!